The Triumphant Return of Precure? Will Go! Princess Precure return the series to its astonishingly magnificent form? All of us here are really, really excited about the new Precure series. We never made much secret of the fact that we weren’t too keen on Happiness Charge Precure. After a run of four of the most entertaining, warm‐hearted and metaphysically profound Magical Girl anime series ever made (Heartcatch to Doki Doki Precure), Happiness Charge dropped the ball. It was nice enough. If it wasn’t being compared to such pure gold as the Great Four, we’d probably have quite liked it as a bit of lightweight entertainment. People who think that lightweight entertainment is all that Precure ever was did enjoy it, I believe. But Precure is a lot more than that. Does Go! Princess Precure return the series to form? Might we soon be speaking of the Great Five instead of the Great Four? It’s a little early to say, but having seen the first episode (thank Meruhenland the Japanese subtitles came out immediately), the prognosis is pretty promising. My first impression of Happiness Charge was chaos. I hoped it would improve over time and honestly I made several attempts to like it. But it remained chaotic and without real direction. The first impression of Go! Princess Precure is one of order. In fact it is more immediately Ordered than any previous Precure, being set in a school a tiny bit reminiscent of Maria Sama ga MIteru. The standard aisatsu (greeting) is even gokigenyou, as in Marimite. The moral lines are clear from the start. Hope vs Despair. After hearing the villain’s set‐piece on despair, Cure Flora gives a speech on the importance of hope and dreams. As we have discussed elsewhere, the Magical Girl genre is traditionally philosophical. The battles themselves are clashes of philosophy, true against false, and the great moments are heralded by speeches setting out the two sides. It is the superiority of the philosophy of good that leads to its victory. The great theme of the show is dreams. Japanese 夢 yume, just like English “dream”, has three meanings. 1. The lunary visions we see while sleeping. 2. Something wonderful (“it was like a dream”). 3. A hope, wish or aspiration. That these three are linked with the head‐meaning of a sleep‐vision is, I believe, fundamental to our human experience, which is why the three meanings are found linked across language families. Vedic philosophy teaches that there are three states of being: the waking state, dreaming, and dreamless sleep. These are not just human states but cosmic actualities. The waking state, of course, is what people are prone to think of as “reality”. Dreams can be good or bad, but when used figuratively in human idioms the meaning is almost uniformly good. It is conceived, while not necessarily better than the waking state, as representing the best that the waking state can be. A very good waking experience is “like a dream”. A “dream” (in the sense of aspiration) is something one fervently wishes to achieve and make “real” (i.e., bring into the waking world). Bad things also inhabit the dream‐world, but bad dreams tend to have a name of their own, other than just “dream”. English “nightmare”, Japanese akumu. As if the real dream world is the good one and the bad one some kind of aberration. There are several very significant similarities in Go! Princess Precure to Heartcatch Precure, the first of the Great Four. The zetsubou (despair) monsters are created by looking into a person’s heart and finding her dream and attempting to “close” it, just as Heartcatch they were made by finding her nayami (worry, unhappiness) inside her heart. Importantly, this wasn’t just a theme. It was closely bound up with what made the series deeper than the ones that had gone before it. 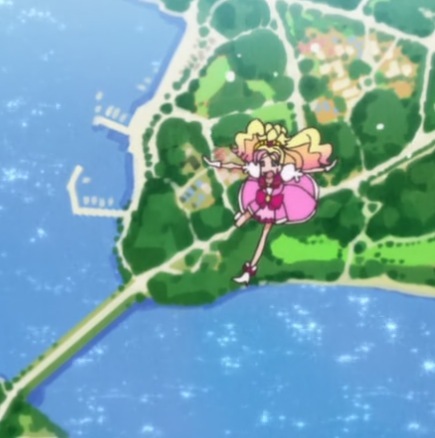 The Precure henshin (transformation) uses perfume, as in Heartcatch, and Cure Flora’s very first experience of her new found power is jumping unbelievably high and getting (not surprisingly) scared by the height. This is a clear and direct reference to Cure Blossom’s first experience of her power in Heartcatch. It seems like a signal that we are moving back to the era that Heartcatch initiated. If we are, I shall be so delighted to have my weekly serving of Truth, fun and pure magic back! Some of the names in Go! Princess Precure are interesting and I think do not come across in English. In the first scene the heroine Haruka meets the Prince‐to‐her‐Princess, Kanata. Haruka means “far” while Kanata means “beyond”, or “the distance”. The two words are frequently found together as a pair in the expression haruka kanata (far in the distance). A couple from far, far away? The first villain is クローズ Kuroーzu. The name is katakana for English “close”, and his phrase for transforming a person’s dream into a monster is クローズ　ユア　ドリーム！”Close your dream” (in katakana‐ized English). 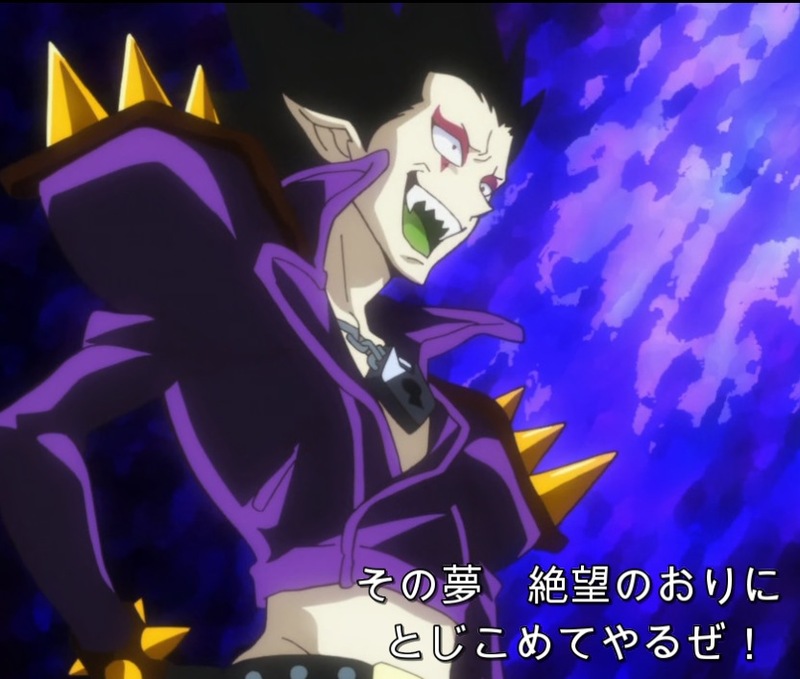 However, 黒 kuro also means “black” and this is certainly an intentional reference to the darkness of the character. Suite Precure – too true to be good? A friend was recently telling me about how many review sites for the kind of anime we watch complain that they are “unrealistically good” or that the conflict between characters is based on misunderstandings and not “real conflict”. The latter remark was made in the case of Suite Precure. Many of the same people refer to Magical Girl anime as a “guilty pleasure” because they see them as vacuous largely because they are “too good”, lack “real conflict” between the good people and operate in terms of good vs evil. Now actually, as we try to show here, the values of the best magical girl anime are actually metaphysically quite deep. Much deeper than the average adult Western movie. 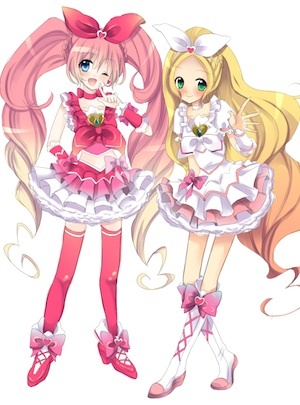 Suite Precure, to take an example, has a theme of music. Music is metaphysically symbolic of the cosmic harmony, of which human harmony is one part. Therefore it is natural that the show should explore the themes of discord vs. harmony. And because (unlike post-modern culture of the Western petty-intelligentsia) its values are not inverted, it is naturally on the side of harmony. To the inverted pop-Western sensibility, harmony and goodness are naïve and therefore enjoying anything insufficiently “dark” is a “guilty pleasure”. Interestingly (although I do not claim to have read a lot of this kind of Western chatter), this is the only way I have ever heard the term “guilty pleasure” used. It appears to mean that something is “too decent”, and therefore the writer is ashamed of liking it. As such “guilty pleasure” seems to be almost a technical term of conscience-inversion: that process by which modern Western pop-society makes people proud of their worst instincts and ashamed of their best ones. I am interested to know, am I correct about this? Is this how the term “guilty pleasure” is generally used? Do pop a comment below!